If you fancy getting your hands on some Gold and don’t mind battling it out with a rather terrifying wolf then you are going to love Wolf Gold, an animal-themed slot from the innovative developers at Pragmatic Play. It features some creative bonus rounds as well a great RTP of 96% and a jackpot of 500x your stake, so what are you waiting for? Why not head out into the desert - but be warned, this wolf doesn’t give up her gold easily! Pragmatic Play has designed a slot game that looks a little bit different to their usual releases. It features a total of 25 paylines and a slot that initially has a 5x3 formation, however, should you unlock the free spins round the reel will change and some of the symbols will increase so that they occupy a 3x3 space keeping this game engaging and fun. The game is set in a desert and you can glimpse some of the rock formations and plants in the background. The sky is a deep purple and pink colour and it is clear the game occurs in the evening. You notice some animals on the reels such as a puma, a horse, a buffalo, an eagle and of course, the wolf. The wolf is a particularly attractive symbol with a purple and blue glow but all of the symbols have a sheen to them making them appear very detailed and this is typical of Pragmatic Play releases. The lower value symbols are the J, Q, K and A which each offer a maximum payout of up to 50 times your stake should you get five in a winning combination. All of the information about multipliers and winning paylines can be found in the paytable at the bottom right-hand side of the screen. Bets begin at £0.25 making this very reasonable for players who are working to a budget, however, those who enjoy a high stakes game will not be disappointed as you can bet up to a maximum of £125 per spin, perfect for when you are feeling particularly lucky. Once you have decided how much you would like to stake using the + and – buttons, then simply hit the black spin button to get the game going. If you want a faster-paced adventure then you can hold down the space bar to launch the turbo spin feature that is sure to delight those who are looking for a quick and dramatic game. 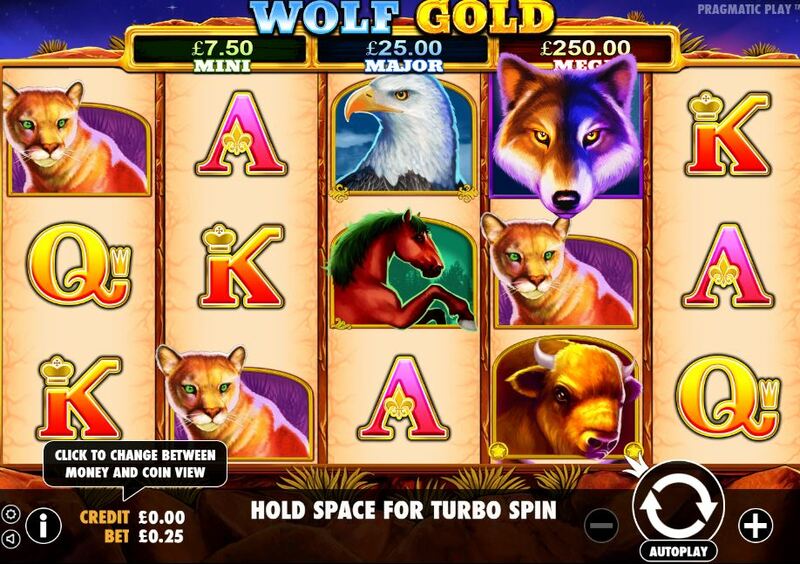 Wolf Gold has a free spins feature that is triggered by landing three of the scatter symbols on reels one, three and five and if you do, you can expect to receive 5 free spins. During this round, if you get further scatter symbols then you will unlock more free spins. The Jackpot and Money Respin round is activated when you see six of the ‘6000 Moon’ symbols on the reels and expect to be wowed as the reels transform and all the other symbols disappear giving the chance to complete three re-spins to try and land identical symbols in a winning payline combinations – boosting your bankroll even further.